Magnets is rated 3.4 out of 5 by 7. Rated 5 out of 5 by HHPh from Great color I did magnet save the dates for a couple getting married and just like their post cards and bi folding cards, the quality of the color and resolution is wonderful. This was my first magnet order so I was a little nervous but they turned out great! Rated 5 out of 5 by Satisfied customer from Well done The final product looked great and arrived right on time. Rated 4 out of 5 by CFDentistry from Nice Quality! Got a deal on some business card magnets and I was quite impressed with the end results. Our patients liked them as well. Rated 4 out of 5 by Ken9099 from Will order again Good print work and value. Will definitely be ordering again. Magnet printing is popular for many reasons. The first being that people like them. They are fun and functional. People like to receive them as freebies because they actually use them. They will hold paper, add style to a bland cubicle, or keep useful contact info on-hand until it is needed. They are rarely thrown away, which is why they are valuable to businesses. They can remain for years on a refrigerator or filing cabinet. Your brand is right in your customer's line of sight for years on end. We offer quantities as low as 25 or as high as 5,000 per order — making them versatile for business or personal needs. Print magnets as small as 2" x 2" or as large as 8" x 4". All magnets are given a high-gloss UV coating to resist fading. 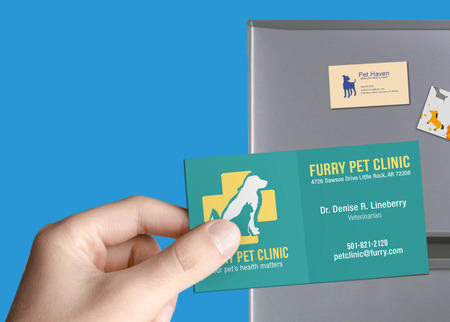 Our magnet layout templates will help you properly create your design. They show you the exact size your artwork should be to print with a professional look. They can be downloaded through a desktop PC in AI, PSD, PDF, or JPG formats combined into one .zip file. Whether in a goodie bag from a conference, or on a refrigerator in a kitchen, magnets stand out. Their thickness and weight bring attention to themselves amongst a sea of paper. Their ability to self-stick to metal surfaces, gives them a prime location in kitchens and offices. This makes them appealing as brand giveaways or for personal events. Save-the-date magnets, for example, are more likely to be kept in plain sight than a postcard. Personalized magnets can also be used as fun fridge magnets, photo magnets, wedding giveaways, or as standard promotional tools. Include useful information like phone number and hours and you'll be the first on every list when your service is needed. They are also great as an alternative to business cards. Business card magnets for instance, are well suited for food services. They also are a good fit for plumbers, electricians, and other specialized services needed by both homes and businesses.